Cue the fireworks, July is here! We're in the full swing of the season with sunny days and warm summer nights. To keep you cool and on-trend all season long, see what Stylist Jocelyn S. is excited to see in your summer Fixes! Keep reading to see our Stylist Jocelyn S’s July Picks! Perk up your summer with light and bright pieces. Midi-length wrap dress: They look good on everyone and catch that occasional summer breeze without a Marilyn Monroe moment to be had. Short sleeve button-up: Swap in your tee for a more buttoned-up version. Embroidered shorts: A little detail goes a long way. 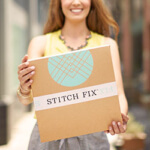 Whether it’s on a pair of denim shorts or flowy shorts, get a pair with a little extra stitching. Statement clutch: A bright clutch means that you’ll never lose sight of your handbag. July style: it’s no sweat in cool fabrics. Chino shorts: Your guy’s favorites, just shorter. Perfect for a T-shirt and shorts kind of afternoon. Lightweight long sleeve: Swap your sweatshirt for a lightweight long-sleeve for the off-chance there’s a cool summer night. Short-sleeve henley: A T-shirt, with a little somethin’-somethin’. Leave them buttoned, or don’t this summer. Slip-on sneakers: If flip-flops aren’t your guy’s thing, slip-on sneakers might be their new everyday shoe. Socks optional (really). Boardshorts: Ready for a dip in the pool whenever you are. Or totally appropriate for sitting in the sun too. What do you want to rock this July? Tell us in the comments!